Approximately, 170 million people globally which are 2– 3% of the world’ s population are infected with HCV, with an estimated 2.7 to 3.9 million people infected in the United States per National Health and Nutrition Examination Survey (NHANES) data. A significant number of those who are chronically infected will develop scarring and poor liver function (cirrhosis) over many years, which can lead to complications such as bleeding, jaundice (yellowish eyes or skin), fluid accumulation in the abdomen, infections, and liver cancer. 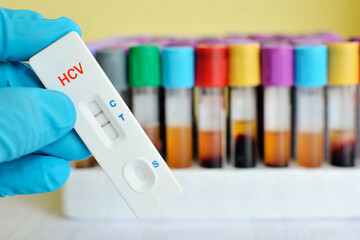 There are unmet needs for nucleic acids new diagnostics that can be applied at the point-of-care to detect HCV infections. A highly sensitive, simple paper strip molecular test that detects HCV at the point-of-care will be developed. The target sequences are amplified using the TARA (Template-Assisted Rapid Assay) technology which is composed of a template-dependent chemical transfer reaction with high turnover, gold nanoparticle-HRP and lateral flow readout. The test should be rapid (<30 minutes), and results in the appearance of colored bands that are detectable by eye.